"Mit der Ausstellung FEEL COLOR verwandelt sich die Bonner Galerie Judith Andreae in ein Farbuniversum der besonderen Art. Vom 04. Mai bis zum 06. Juli 2019 werden dort neue, großformatige Arbeiten der Lichtkünstlerin Regine Schumann zu sehen sein. Schumanns Installationen arbeiten mit überraschenden visuellen Effekten. 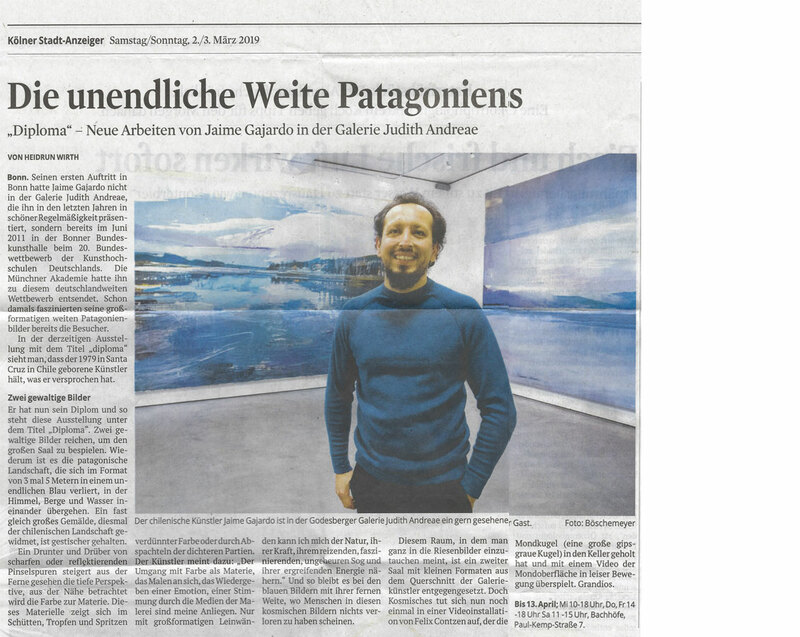 ..."
"The solo exhibition DIPLOMA shows a selection of new works by the Chilean painter Jaime Gajardo (*1979 in Santa Cruz, Chile), which were recently created for his degree at the Academy of Fine Arts in Munich. Jaime Gajardo studied since 2006 in the class of Prof. Anke Doberauer and since 2012 with Prof. Jean-Marc Bustamante, with whom he receives his diploma in February 2019. ..."
"Begegnungen auf einer Gurkenparty. 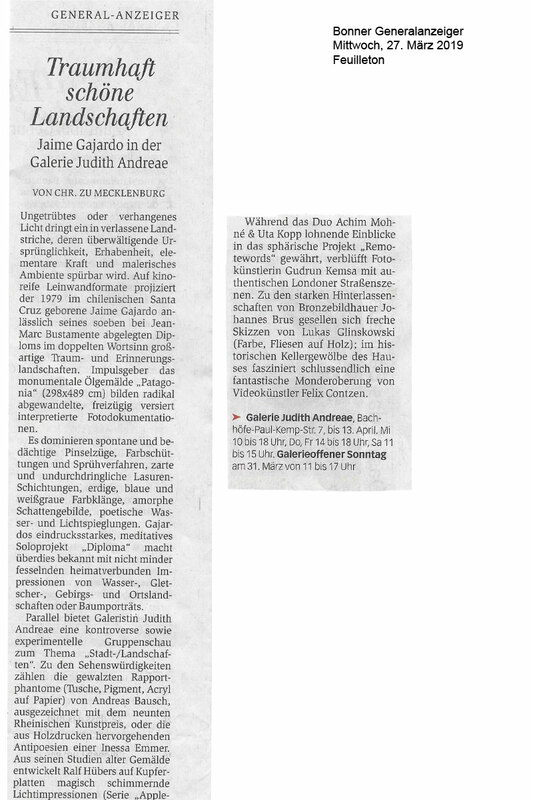 Spannende Ausstellung von Johannes Brus in der Bonner Galerie Judith Andreae"
"JOHANNES BRUS, 21 Nov 2018 — 27 Jan 2019 at the Galerie Judith Andreae in Bonn, Germany"
Rhein-Sieg-Kreis (ke) - Since yesterday (3 December 2018) it has been decided: Andreas Bausch is the new winner of the Art Prize of the Rhein-Sieg-Kreis. In the summer of this year, the Rhein-Sieg-Kreis had held the Rheinische Kunstpreis for the ninth time. After a full-day session, the jury, chaired by Dr. Ing. Gabriele Uelsberg, director of the LVR-LandesMuseum Bonn, now by mutual agreement for the artist living in Cologne. 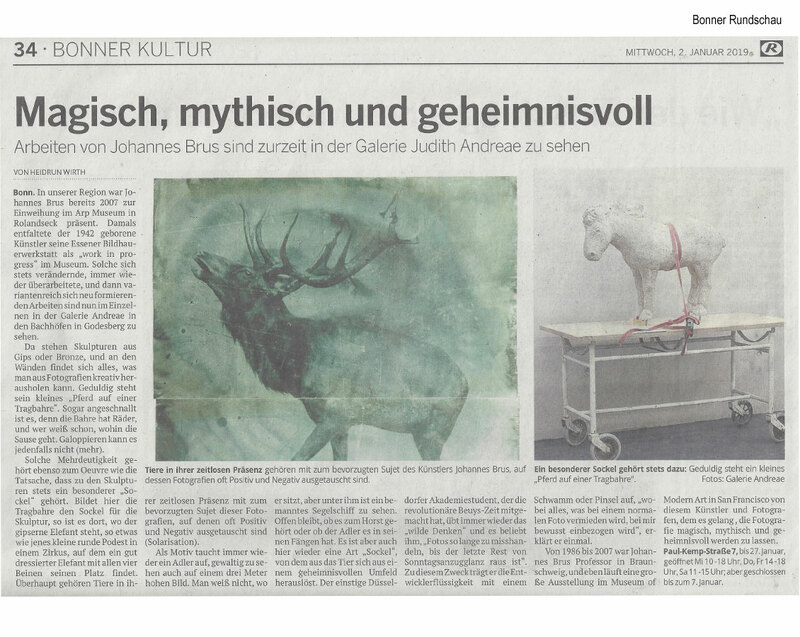 "Galerie Judith Andreae shows from the end of November selected works of the photographer and sculptor Johannes Brus (b. 1942 in Gelsenkirchen). Since the end of the 1950s, the artist has been dealing with the relation between photography and sculpture. His sculptures often reveal parallels to his photographic works, and even his photographs emerge in a process that can be described as 'sculptural'. In the exhibition "Johannes Brus" these parallels should be pointed out. Large and small format photographs contrast with his concrete and bronze sculptures. (...)"
"Detailreich - Erfolg macht mutig: Münchens zweite Paper Positions"
"ALLES PAPPE - Arbeiten auf und mit Papier: Hildegard Elmas Aquarell (o., ohne Titel, 2016)"
"Sixteen artistic positions show how differently the medium of paper can be used. It is edited, serves as a background, is part of an installation and a carrier of color. Large-scale and small-format works by Andreas Bausch, Mahmut Celayir, Nikola Dimitrov, Hildegard Elma, Meike Entenmann, Paola Fonticoli, Dietrich Helms, Ildefons Hyöng, Magdalena Kita, Susanne Lyner, Rune Mields, Regine Schumann, Viktoria Strecker and Birgitta Weimer, Francis Zeischegg and Jeanette Zippel will be presented. ..."
"Kunst bei Nacht erlebt. Viele Kunstfreunde nutzen die Nacht der Galerien in Bad Godesberg"
Achim Mohné shows in his second solo exhibition in the gallery Judith Andreae parallel to the small climate summit 'in Bonn (UNFCCC), works from a series of media performances with scanners and objects, which he operates since 2000. Most of the pictures will be taken during the Night of the Galleries. New art for museums in Cologne: Friends of ART COLOGNE announce purchases. New work for the MAKK from Regine Schumann. "The solo exhibition Tourné in the gallery Judith Andreae shows young fresh paintings and works specially created for Bonn by the Munich artist Antje Zeiher (* 1979, Reutlingen) .The master student of Jean-Marc Bustamente received her diploma at the Academy of Fine Arts in 2016 Munich. ..."
"Immediately after her extensive solo exhibition ‚Daseinsformen’ at the Osthaus Museum Hagen, Galerie Judith Andreae presents with ‘Wahrscheinlichkeitswolken’ the first individual exhibition of Birgitta Weimer.[...]" "Kunstmesse: Fischköppe und andere Raritäten"
"Parallel to the United Nations Climate Change Conference, which takes place in Bonn in November 2017, and the exhibition Weather Report – About Weather Culture and Climate Science at the Bundeskunsthalle, the artist Achim Mohné presents a thematically related, large-scale work in the forecourt of the Bundeskunsthalle. [...]"
"Die irritierende Schönheit der Katastrophe. Galerie Judith Andreae mit 'The Planet Is Blue'." "The exhibition autumn at Galerie Judith Andreae is under the impression of the World Climate Conference, which will take place from November 6th to 17th 2017 in Bonn. Artists of the gallery, as well as guest artists, present works that show the beauty and at the same time the fragility of the earth. [...]"
"Das Geheimnis des Knollenkrümmels. 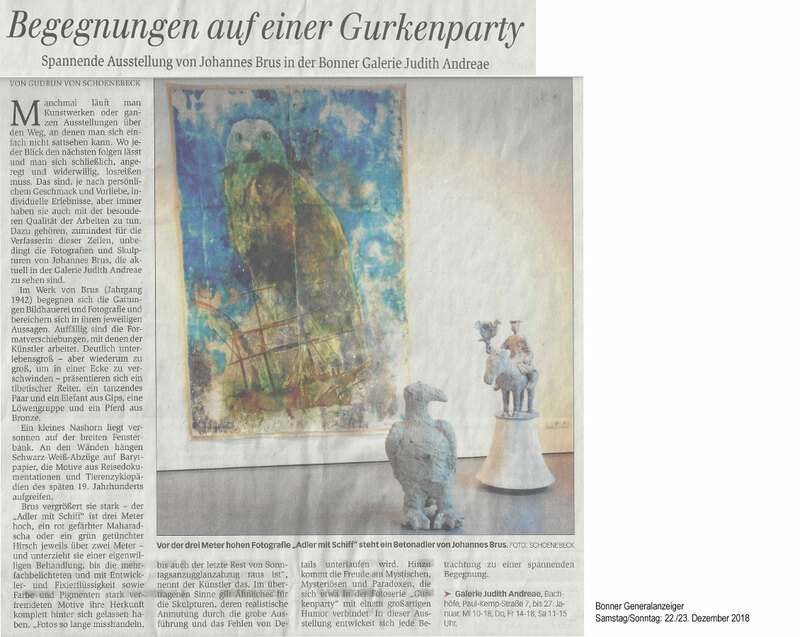 Bonner Ausstellungen: Deva Wolfram im Kunstraum 21, Francis Zeischegg bei Andreae." "With "view control" Galerie Andreae presents the Berlin artist Francis Zeischegg for the second time in a single exhibition. In the spotlight are new drawings, wall works, models and objects. With the exhibition, the artist refers to real and virtual visual constructions and views. [...]"
Ausstellung POSIITIV mit Tobias Grewe und Heiko Räpple. 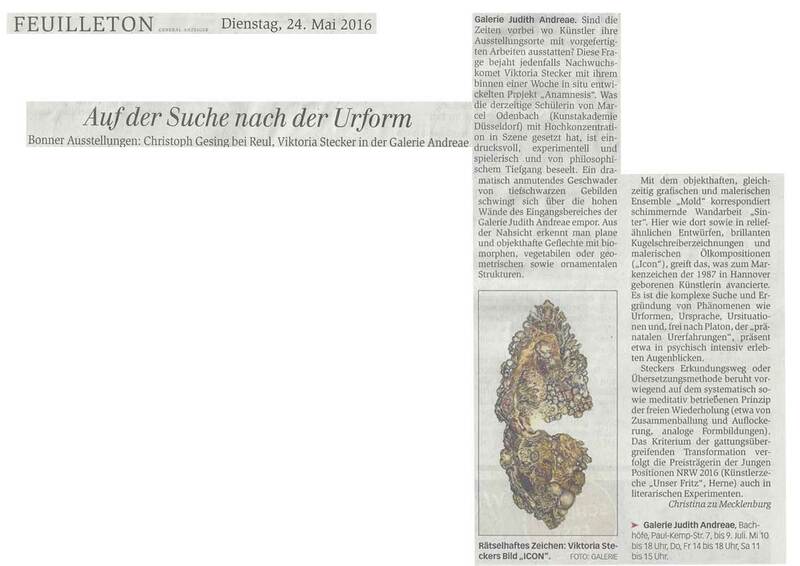 "Auf der Suche nach der Urform"
"In the context of the solo exhibition ANAMNESIS, Galerie Judith Andreae presents works of Viktoria Strecker (born 1987 in Hannover) for the first time. The student of Marcel Odenbach at Kunstakademie Düsseldorf deals with expressions of elementary perception. In delicate working processes of almost manic repetition, Strecker explores the possebilities of a timeless and generally valid ancestral structure. [...]"
"Francis Zeischegg zeigt Arbeiten in der Galerie Judith Andreae." "Gezeigt werden Installationen und Zeichnungen der in Berlin lebenden und arbeitenden Künstlerin. Sie stellt in all ihren Arbeiten grundlegende Fragen nach der Wahrnehmung des Menschen im Raum, in der Stadt oder wo immer er lebt und agiert. [...]"